Having seen a worrisome 800 point decline in the Dow, Asia opened on an equally cautious note. All core indices opened at least 1% lower with only Shanghai and the Australian All Ord’s showing any kind of a recovery (despite some poor data). Many are concerned over the inversion of parts of the Treasury curve and as a result, is seeing risk scaled back and money being taken off of the table. However, we did see some positive economic data released in China (PMI) and that probably was the main reason given for their stock recovery. The Nikkei managed to scrape its way back to close just -0.5% down, but after a dreadful opening that was a good result. The Yen did not continue its safe haven bid and is seen back with a 113 handle late in European trading. Even though we saw better than expected GDP numbers, the uncertainty surrounding Europe with BREXIT, ITALY and possibly France is having negative effects all around. Today all core indices lost over 1% with the only positive being, it is a little better than where they opened. UK government is debating all the angles but the news appearing is anything but positive. GBP has traded in a tight range and any rally is met by heavy selling. The talk is that the UK may simply forget the Article 50 trigger following yesterdays ECJ ruling. This, however, is against what the people voted for back in June 2016 and any reversal of that decision may well be met by more unrest. Sterling is playing in a tight range but the trend remains heavy. Headlines will continue to dominate trading and speculation surrounding Theresa Mays position is bound to crop-up sometime. European rates market is rumored that the core buyer is active in Italian and Greek paper while Gilts and the core give a little back. The US market is closed to respect the funeral of George H W Bush. 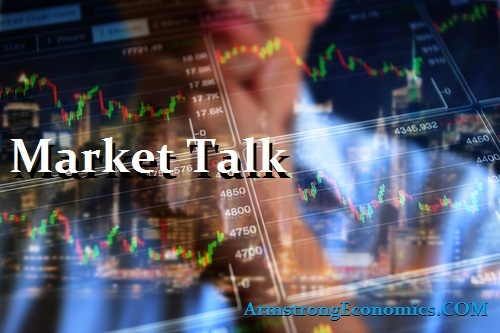 The market will now look to focus on Fridays unemployment number and the hourly earnings figures again. All eyes will again be focused on the Treasury market inversion and also looking for addition sub 2.90% advance in 10’s.